1.8 Million Year Old Tool Found! 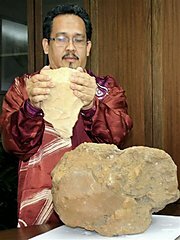 Mokhtar Saidin, director of the Center of Archaeological Research at the University of Malaysia, holds a 1.8 million-year-old artifact during a press conference on Penang Island, Malaysia, Thursday, Jan. 29, 2009. Malaysian archeologists have unearthed what they claimed Friday were the world's oldest prehistoric stone axes. Seven axes were found with other tools at an excavation site in Malaysia's northern Perak state in June, and tests by a Tokyo laboratory indicate they were about 1.83 million years old, said Mokhtar Saidin, director of the Center for Archaeological Research at the University of Science Malaysia. The group released their conclusions Thursday, and other archeologists have not yet examined the results. "It's really the first time we have such evidence (dating back) 1.83 million years," Mokhtar said, adding that the oldest axes previously discovered were 1.6 million years old in Africa. However, other chopping tools, as well as human remains, have been found in Africa that are much older, with some dating back 4 million years, he said. The stone hand-axes were discovered last year in the historical site of Lenggong in northern Perak state, embedded in a type of rock formed by meteorites which was sent to a Japanese lab to be dated. "We received news from Japan two weeks ago which said it is 1.83 million years old, so this find shows the existence of human beings there 1.83 million years ago. This is the earliest evidence of Paleolithic culture in the Southeast Asian region. This new find in Malaysia is actually older than those in Georgia and China, but the difference is that what we found was the tool, and we have to continue to look for the human bones,"
Mokhtar said he believed the hand-axes were used by homo erectus, an extinct early human. Internationally, the two oldest fossils are from Georgia (1.8 million years old) and China (between 1.7 and 1.8 million years). The oldest human skeleton ever found in Malaysia is the 11,000-year old Perak man, discovered in 1991.